We often accumulate contact information on our phone over time, only to find contacts later that we don’t need or care about. Still we are hesitant in deleting them thinking “what if I need it one day”. Wouldn’t it be nice if we could delete those contacts from our phone, but still be able to look them up when that “one day” comes? This is now possible with IntouchApp! 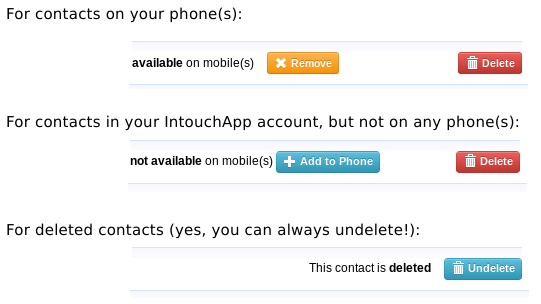 When you delete a contact from your phone, it is removed from your phone and all other connected devices, but it is still available for you when you access your contacts at intouchapp.com. This way, you can delete contacts from your phone to your heart’s content while knowing that you can access those contacts in future whenever you need them. You can keep your phone contacts clean now from the comfort of your PC and the mouse!